Springtime can feel a little awkward in the kitchen. We’re craving light, bright and crisp flavors, but still balancing warm days with cool and even frosty nights. It’s a temperamental time that always has me wanting something less than heavy root vegetables and something more than grilled fish. 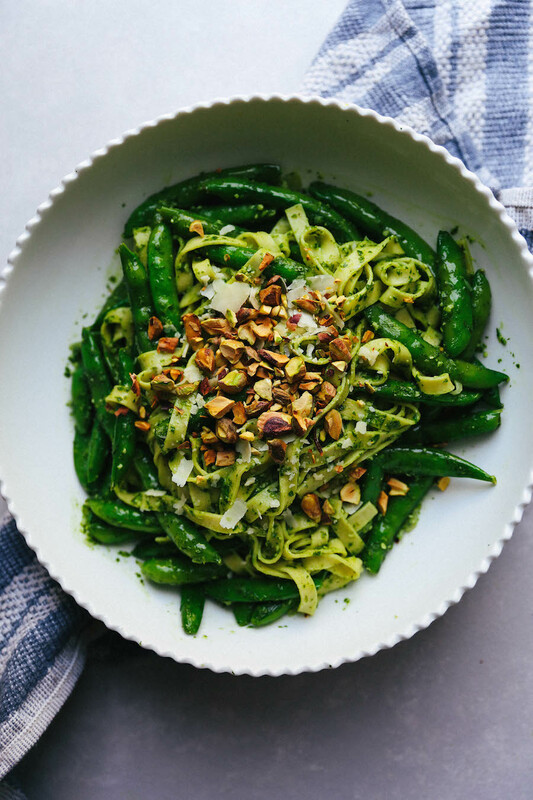 And then I remember this light and lemony recipe for Arugula Pesto Fettuccine with Snap Peas and all is right again. Adapted from a recipe that arrived on my doorstep (quite literally) two years ago via Blue Apron, this pasta is the perfect way to incorporate early spring’s market finds. I prefer fresh fettuccine noodles to store-bought as they are less dense and coat beautifully with the peppery arugula pesto. 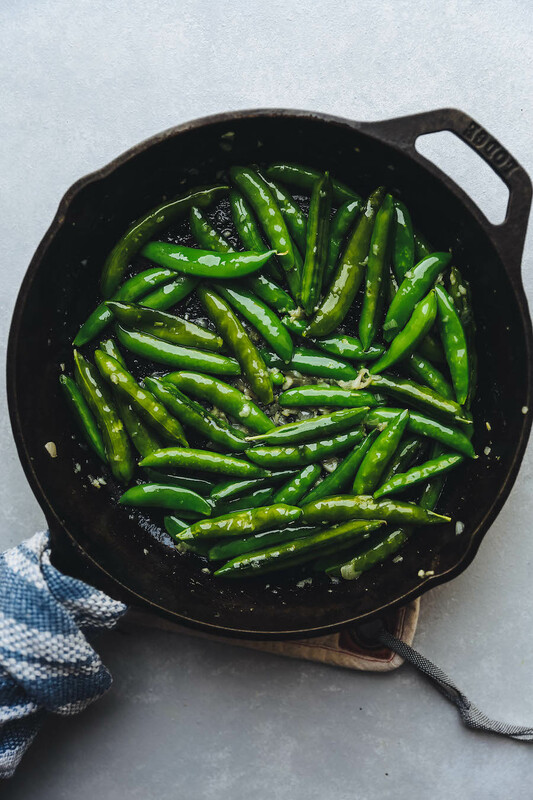 The bright green snap peas add just a touch of sweetness and crunch, giving the whole plate a very fresh and healthy vibe. Topped with toasted, chopped pistachios and an extra squeeze of lemon, this dish is good enough for company and simple enough for a weeknight meal - two very important qualities in a recipe if you ask me. I hope this recipe gets you through our beloved and moody spring season, and as always, enjoy! 1.) Heat a medium pot of water to boiling. Meanwhile, prepare the fresh produce. Snap off the ends of each sugar snap pea and pull off any tough strings that run the seam of the pod. Thinly slice the shallot and mince the garlic. Juice and zest the lemon. 2.) To make the pesto, place the arugula, lemon zest and Parmesan cheese in a food processor. Begin pulsing, and drizzle in enough olive oil to create a rough paste. Next, add the juice from the lemon into the food processor and pulse to combine. Season with salt and pepper to taste and set aside in a bowl. 3.) If you haven’t already, toast the pistachios in a pan over medium heat until brown and fragrant. Transfer to a cutting board and roughly chop. 4.) Using a large skillet, melt the 2 Tbsp. butter over medium-high heat. Then, add the minced garlic and sliced shallot and season with salt and pepper. Cook, until softened, about 2 to 4 minutes. Then, add the sugar snap peas and season again with salt and pepper. Cook until the peas are bright green, about 1 minute, and remove the skillet from the heat and set aside. 5.) Add the pasta to the pot of boiling water and cook 2 to 3 minutes or according to instructions. Once cooked, reserve 1/2 cup of the cooking water and drain the pasta. 6.) To assemble, add the pasta, arugula pesto and half of the pasta water to the pan of cooked snap peas. Use tongs to combine and evenly distribute the pesto. Season with salt and pepper to taste. If the pasta seems dry, add in more of the remaining pasta cooking water. Next, plate the pasta and sprinkle with chopped pistachios, Parmesan cheese and an extra lemon wedge.